The Unicorn and Dance Umbrella join forces for an exciting new mixed bill of award-winning, international dance for under 12s - and only under 12s! This show is not open to adults. Three exceptional dance performances choreographed by Wayne McGregor, Hege Haagenrud Sébastien Ramirez and Honji Wang - each with a distinctive style and all visually stunning - come to the Unicorn in this event. This is dance at its best. There will be three performances only. Adults / over 12s will be admitted into the matinee performance on 28 Oct; all evening performances will be for under 12s exclusively. Parents, carers and older siblings are invited to take part in a range of foyer activities devised by Comber Grove Primary School while their children are watching the performances upstairs. Hege Haagenrud is the most performed choreographer for young audiences in Norway. In this trio she uses text as well as movement to consider the ups and downs of friendship. An inventive hip hop duet full of combative energy - an international hit, this duet was recently awarded a Bessie award in New York. A resident choreographer of the Royal Ballet, whose company is resident at Sadler's Wells, Wayne McGregor is known for his thrilling, fast and athletic style, as this piece will reveal. Triple Bill is part of Dance Umbrella Festival 2014. Why have we banned the adults? Watch a discussion between Emma and Purni. Our young audience members will be looked after by our friendly Front of House team and the Triple Bill compere, Peter Laycock - a freelance dance artist who has worked extensively in a wide variety of educational and community settings across the UK. In the meantime, adults will be invited to enjoy an installation in our foyer, part-curated by Comber Grove Primary School. 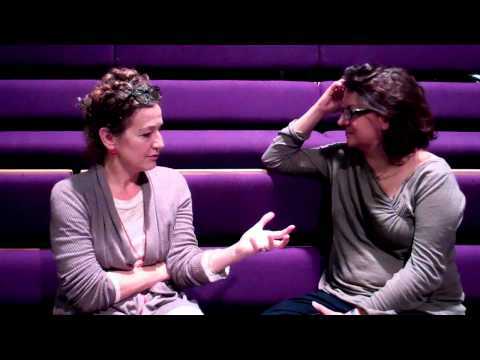 Watch a short documentary about the making of the foyer activities. What happens when you ask a group of 9 & 10 year olds to create an installation for adults?